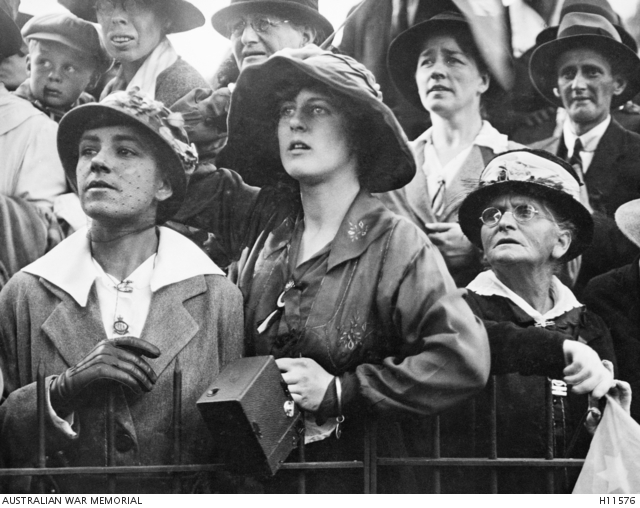 Boxing Day 1918. Leith dockyard. A pipe band played as the returning POWs walked down the gangplank and onto the dock, where they were greeted by local dignitaries and army officers. Some of the men noted with disappointment that the dock gates were locked and the locals kept away. The enthusiastic public parades that had welcomed arrivals a month earlier were missing. The Queen joins me in welcoming you on your release from the miseries & hardships, which you have endured with so much patience and courage. During these many months of trial, the early rescue of our gallant Officers & Men from the cruelties of their captivity has been uppermost in our thoughts. We are thankful that this longed for day has arrived, & that back in the old Country you will be able once more to enjoy the happiness of a home & to see good days among those who anxiously look for your return. On Scottish soil once more, Andy was tantalisingly close to Ayr and his childhood home. But after a hot breakfast in a dockside warehouse he entrained for Ripon in Yorkshire. As the train left the waterfront, Andy probably saw people waving and cheering from a distance. Despite having been locked out of the docks, locals lined the railway tracks to welcome the prisoners home. At Ripon Andy underwent further medical examination and was interviewed about his time as a prisoner of war. Once the debrief was completed, he was granted leave until 30 January. On 29 January Andy reported to Headquarters with an injury to his middle left finger. He was admitted to the 3rd Auxiliary Hospital, where he stayed until 10 February. 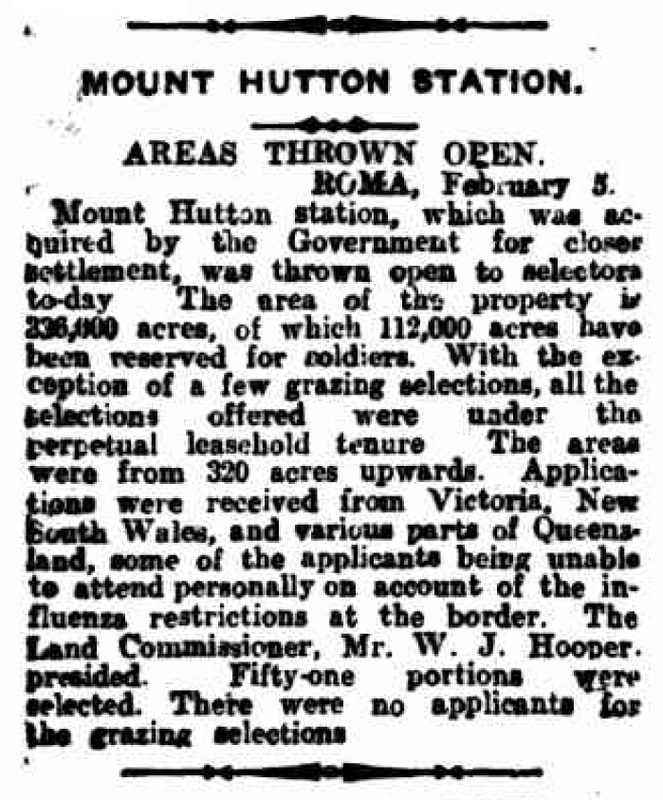 Mrs. Duncan, of Ararat-road, Beaufort (Victoria), writes to “The Miner” stating that she has been informed by the military authorities that her husband, Warrant-Officer Andrew Stewart Duncan, who is well known in Broken Hill, and who was captured by the Germans on March 1, 1918, and has since been a prisoner of war, has been released, and arrived in London, quite well in health, on December 26. In a message to his wife W.O. Duncan wishes the members of his R.A.O.B Lodge and all other friends a happy, and prosperous new year. Upon discharge from hospital Andy was granted 44 days paid leave in England. This was the ‘Anzac leave’ granted to 1914 enlistees. There is no record of how Andy spent his furlough in England. 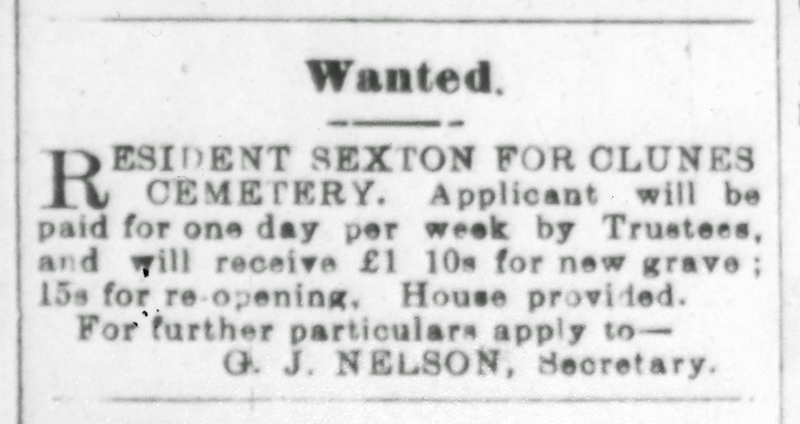 It would be nice to think he visited family in Ayr, seeing his parents again one last time (his father John would die in 1922; his mother Elizabeth in 1927). On 12 May Andy finally embarked for home on board HMAT Soudan. It was very different from the 1914 voyage, with training drills and fatigues replaced by reading in the YMCA library on board and by regular concerts. 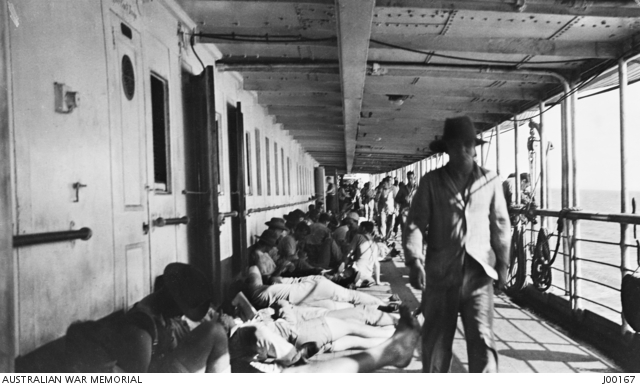 Troops on the promenade deck of the HMT Kildonan Castle returning to Australia. The decks presented this appearance practically all day long. Warrant-Officer A. S. Duncan (1057) [sic], 10th Battalion, arrived in Melbourne on June 29th last, after four years and nine months’ service, having been a prisoner for the last twelve months. Jane was at Port Melbourne to welcome him. 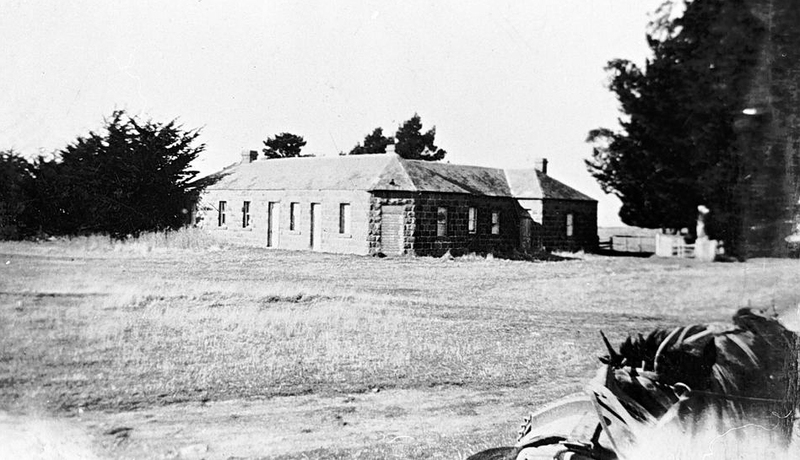 She had written a flurry of letters to the Defence Department about Andy’s return, to secure a train pass to Melbourne and to ask for Andy’s battalion colours. It appears she was instrumental in arranging for him to disembark at Melbourne rather than returning to Adelaide. It is easy to imagine Jane anxiously scanning the arriving ship and khaki uniforms for the violet and blue colour patch and for Andy’s face. It is not so easy to imagine the overwhelming mix of emotions that Jane and Andy felt as they embraced for the first time in so long. Waiting for a glimpse of their loved ones. 1919 ‘In Broken Hill’. Barrier Miner (Broken Hill, NSW : 1888 – 1954), 16 January, p. 4. [ONLINE] Available at: http://nla.gov.au/nla.news-article45468786 [Accessed 27 April 2013]. 1919 ‘Personal’. Barrier Miner (Broken Hill, NSW : 1888 – 1954), 18 July, p. 2. [ONLINE] Available at: http://nla.gov.au/nla.news-article45537445 [Accessed 27 April 2013]. Concert and Theatre Programs Collection – First World War 1914-1918, Series 1, Sub-series 1, File 4, Item 7: Ships concert. PUBS002/001/001/004/007. Australian War Memorial, Canberra. Duncan, John. 1922 (Statutory Deaths 578/01 0097). Statutory Deaths 1855-2012, National Records of Scotland [ONLINE] Available at: http://www.scotlandspeople.gov.uk [Accessed 27 March 2012]. Duncan, Elizabeth. 1927 (Statutory Deaths 578/01 0437). Statutory Deaths 1855-2012, National Records of Scotland [ONLINE] Available at: http://www.scotlandspeople.gov.uk [Accessed 24 May 2012]. Henry Thomas Fowler (1882-1947) – a Life. [ONLINE] Available at: http://www.thedanishscheme.co.uk [Accessed 06 April 2014]. ‘Hand written Letter of Recognition for World War 1 POW from King George V 1918 sent to Lance Corporal James Cordingley’. [ONLINE] Available at: http://commons.wikimedia.org/wiki/File:Hand_written_Letter_of_Recognition_for_World_War_1_POW_from_King_George_V_1918_sent_to_Lance_Corporal_James_Cordingley.jpg [Accessed 06 April 2014]. Jones, M.A. 2009. 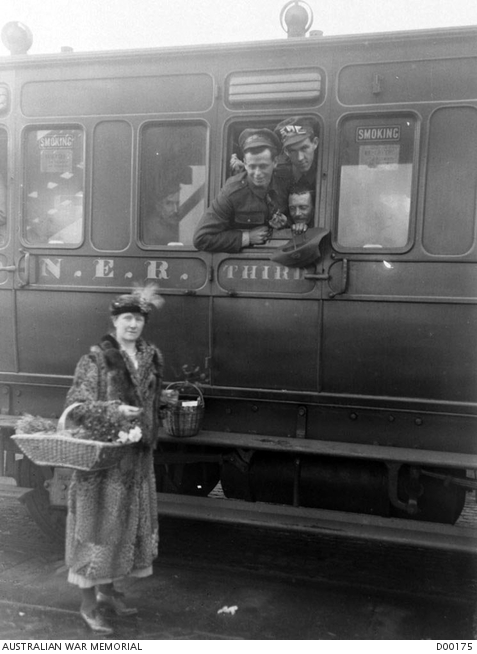 The Danish Scheme: The repatriation of British Prisoners of War through Denmark at the end of the First World War. South Australian Red Cross Information Bureau. 2016. Packet content | South Australian Red Cross Information Bureau. 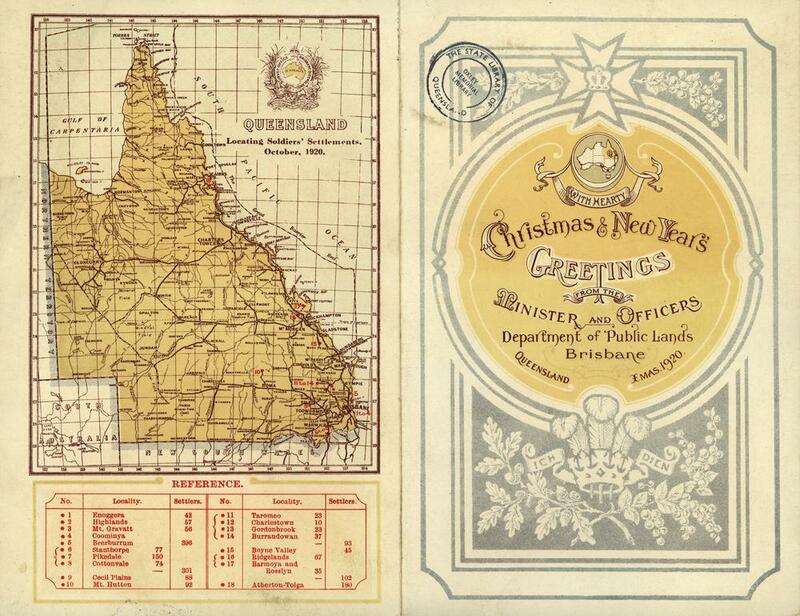 [ONLINE] Available at: https://sarcib.ww1.collections.slsa.sa.gov.au/packet-content/54253#https://sarcib.ww1.collections.slsa.sa.gov.au/sites/default/files/packet_images/7574/SRG76_1_7574_1.jpg. [Accessed 11 June 2016]. I get the impression that John Stewart was a hard man. He lived a frontier life, born in Van Diemen’s Land in 1845, growing up in pre-gold rush Geelong and then on the central Victorian goldfields. He raised his own family at Eurambeen and the Fiery Creek goldfields. John learned the stonemason’s trade from his father. His work can still be seen in some of the old buildings not far from Ballarat. One of the buildings on which John Stewart worked as stonemason. 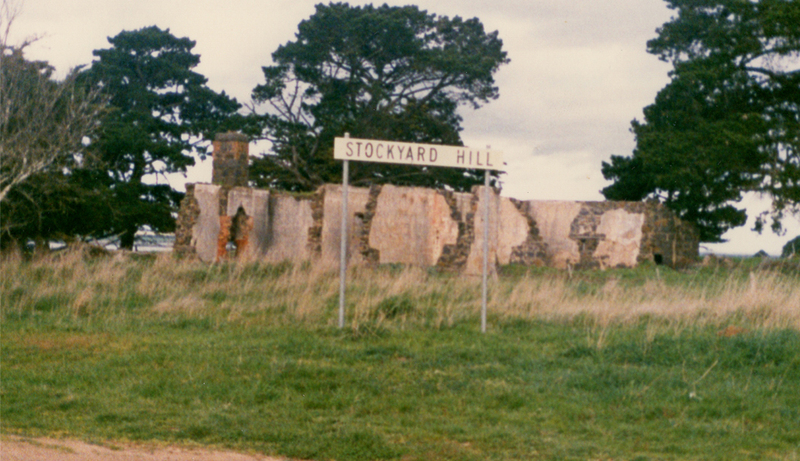 Stockyard Hill Hotel 1988. From the author’s collection. Copyright Andrew Palmer. John Stewart was 31 when he married 19-year-old Elizabeth Ann Ball in the Beaufort Primitive Methodist Church on 18 May 1877. As a young man he would have cut a rugged figure; not tall but solidly built with a jet-black bushranger beard. My father was only two years old when John Stewart died in 1944. But he has a strong image of John sitting in a rocking chair on the back porch at Beaufort, his face hidden under the brim of his hat, puffing away on his “big, old, stinky pipe”. 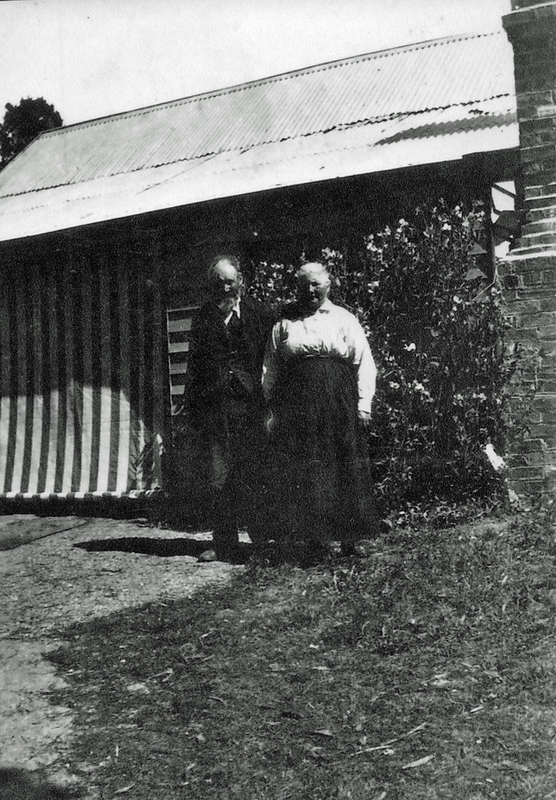 John and Elizabeth Stewart, 108 Neill Street Beaufort. From the author’s collection. Copyright Andrew Palmer. 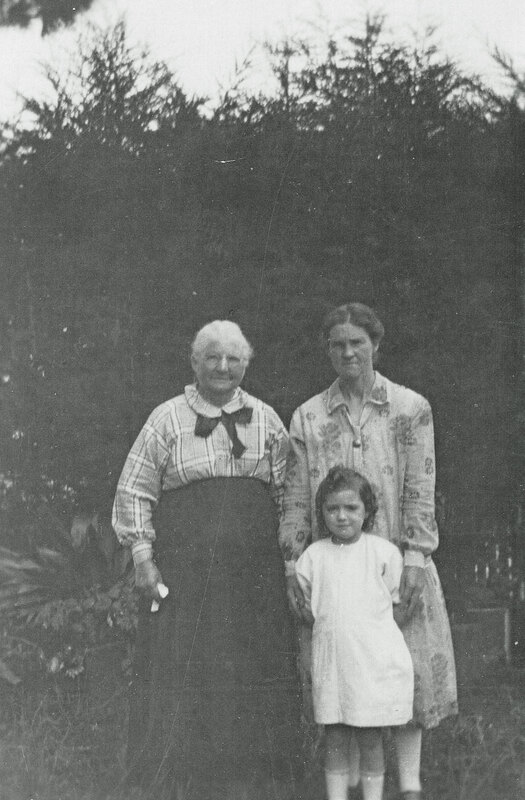 Rene remembered Elizabeth Ann Ball as a “lovely lady”. It was Elizabeth who kept a welcoming home and maintained strong relationships with her children and grandchildren. 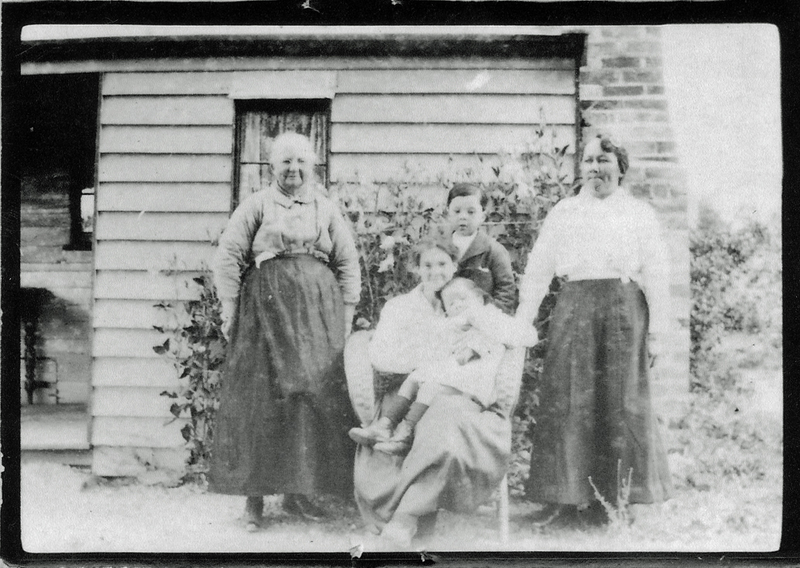 Elizabeth Ann Stewart (nee Ball) with her daughter Jane (seated), daughter-in-law Amelia Bruce Tan Loo Stewart and Amelia’s children Clarence and Nellie Stewart. From the author’s collection. Copyright Andrew Palmer.